"Networking is more about 'farming' than it is about 'hunting'. It's about cultivating relationships." This 29 March 2019, we are opening the house to meet more like-minded business professionals like yourself. At this exclusive session, you will get to mingle, connect and form strategic relationships with over 40 dedicated business owners from various industries. During this exclusive session, you will hear from our very own video production guru, Mr Mark Foo from The Story Behind. 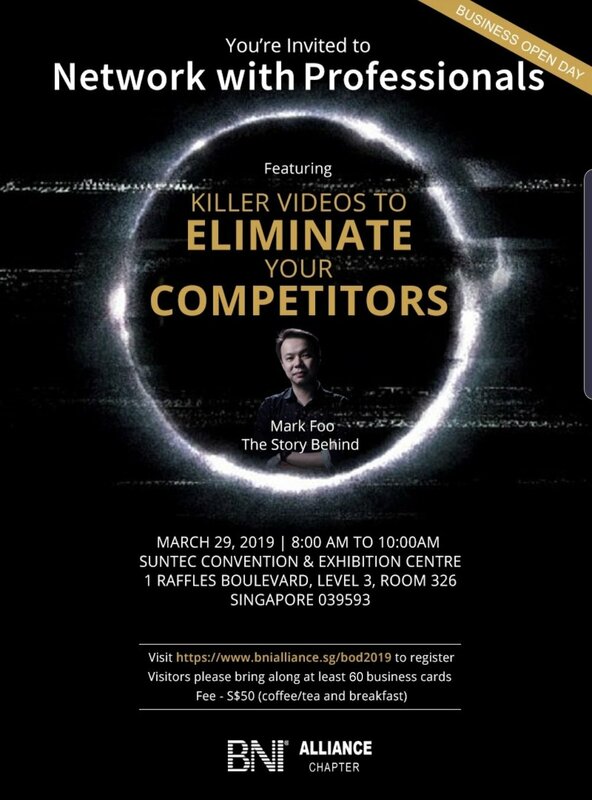 He will be sharing more about the effectiveness of video marketing and how videos has helped businesses achieve milestones while standing out from the rest of the competition. We are excited to meet you in person, and hear how we can help you grow your business. Part of BNI Singapore Far East Region. © 2019 Alliance Singapore. All Rights Reserved.